Drs. 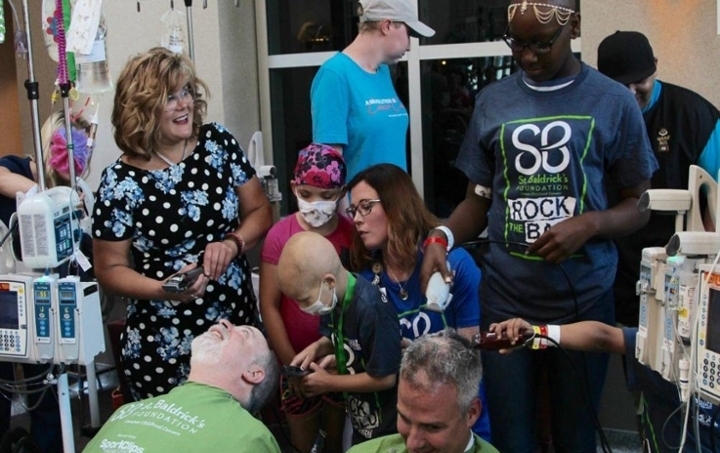 Bruce Gordon and Don Coulter getting their heads shaved for the St. Baldrick’s Foundation. Drs. Stefanie Lowas, Pediatric Hematology/Oncology, and Mohan Mysore, Pediatric Critical Care, discussing a poster at the 2014 Pediatric Research Forum at Children’s Hospital & Medical Center. Kate McKillip, M.D., Medicine/Pediatrics resident, answers questions from Dr. Terry Zach, Neonatology, about her research at the 2014 Pediatric Research Forum at Children’s Hospital & Medical Center. While presenting a poster related to pediatric infectious diseases, Chad Wetzel, MPH, explains their study to Dr. Bradley Britigan, Dean of the College of Medicine. 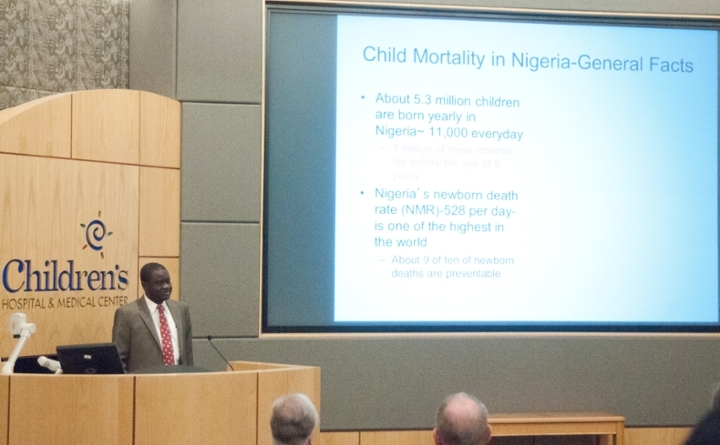 Dr. Stephen Obaro, pediatric infectious disease professor, was the invited speaker at the 2015 Pediatric Research Forum. Dr. Obaro has been conducting research in Nigeria for the past five years. Dr. John Sparks, Chair of the Department of Pediatrics, and Dr. Christina Lettieri, Pediatric Hematology/ Oncology Assistant Professor, at the poster presentations at Children's Hospital & Medical Center. Dr. Karoly Mirnics was the invited speaker at the 2016 Pediatric Research Forum held at Children's Hospital & Medical Center. Dr. Mirnics is the new director of the Munroe-Meyer Institute. Drs. Bruce Gordon and Don Coulter getting their heads shaved in 2017 for the St. Baldrick’s Foundation. Dr. Shelby Kutty, pediatric cardiology professor, was the invited speaker at the 2018 Pediatric Research Forum. Dr. Don Coulter, pediatric hematology/oncology associate professor, speaks at the September 2018 Pediatric Cancer Research Group meeting. Information regarding upcoming presentations and videos of previous presentations can be found on this page.